"Peacebuilders are important to the world. So are snakes." The metamorphosis of Saint Nicholas into the more commercially lucrative Santa Claus, which took several centuries in Europe and America, has recently been re-enacted in the saint’s home town: the city of Demre. This modern Turkish town is built near the ruins of ancient Myra. As St. Nicholas is a very popular Orthodox saint, the city attracts many Russian tourists. 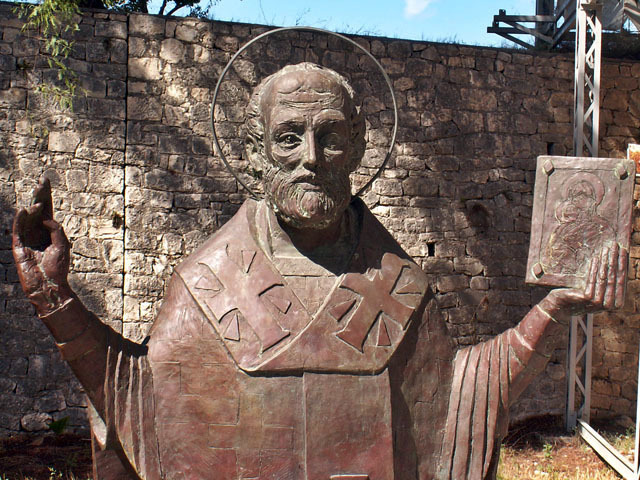 A solemn bronze statue of the Saint by the Russian sculptor Gregory Pototsky, donated by the Russian government in 2000, was given a prominent place on the square in front of the medieval church of St. Nicholas. In 2005, mayor Suleyman Topcu had the statue replaced by a red-suited plastic Santa Claus statue, because he wanted the central statue to be more recognizable to visitors from all over the world. Protests from the Russian government against this action were successful only to the extent that the Russian statue was returned, without its original high pedestal, to a corner near the church. Alas, poor Russia. So far from God, so close to the North Pole. This entry was posted in Something Righteous This Way Comes and tagged christmas on December 24, 2012 by Joseph Fouche. Politics is the division of power. It is a climate whose state and behavior result from a constantly unfolding pattern of interference generated by agents that act and react. Politicking is interference in politics. It is the range of possible patterns allowed by the current state of the political climate. Policy is a specific state of interference that politicking should build towards. War is violent politics. It is a climatic constant of now more and now less prominence. Warfare is politicking in war. It is whatever patterns of violent politicking the current state of the political climate supports. Strategy is violence-laced interference that warfare should converge upon. This entry was posted in The Final Appeal and tagged politics, war on December 22, 2012 by Joseph Fouche. This entry was posted in Something Wicked This Way Comes and tagged war on December 20, 2012 by Joseph Fouche. There is no such thing as “nuclear” warfare. Use of the catchall term “nuclear warfare” mixes up two distinct forms of warfare: fission warfare and fusion warfare. Fission warfare uses influence and violence produced by splitting atoms of certain elements for a war. Fusion warfare uses influence and violence produced by merging atoms of certain elements for a war. Violence in fission warfare has an upper bound imposed by physics that places limits on its physical side-effects. Violence in fusion warfare has no upper bound imposed by physics that place limits on its physical side-effects. Successful use of fission warfare is possible because its violence is intrinsically limited. Successful use of fusion warfare is problematic because its violence has no intrinsic limits (at least on a planetary scale). The influence produced as an effect of fission warfare or fusion warfare is hard to anticipate since that influence acts on the human mind and that mind, as an agent unto itself, reacts in ways that no existing predictive model can predict with uniform accuracy. However, knowledge that the violence of fission warfare has limits can reduce the influence produced by fission warfare because the target of its use can react with measures like dispersion to counter its effects. Knowledge that the violence of fusion warfare is only limited by the motives or production capacity of an opponent and that counter-measures have a slim chance of success can boost the influence effects that might be produced by fusion warfare. The analysis of War Minister Anami Korechika and other officers in the Japanese military after Hiroshima and Nagasaki that the military effects of fission warfare were not intrinsically different from military effects produced by other forms of Allied warfare like the American aerial bombardment or naval blockade was not fundamentally wrong or irrational. Their suggested alternative plan of forcing the Allies to invade Japan and fight an Okinawa-style exhaustion campaign as the best way to force the Allies to negotiate terms that would allow Japan to escape World War II with some of its gains was not intrinsically wrong or irrational. Despite the best that has been done by everyone — the gallant fighting of the military and naval forces, the diligence and assiduity of Our servants of the State and the devoted service of Our one hundred million people, the war situation has developed not necessarily to Japan’s advantage, while the general trends of the world have all turned against her interest. Moreover, the enemy has begun to employ a new and most cruel bomb, the power of which to damage is indeed incalculable, taking the toll of many innocent lives. Should We continue to fight, it would not only result in an ultimate collapse and obliteration of the Japanese nation, but also it would lead to the total extinction of human civilization. Such being the case, how are We to save the millions of Our subjects; or to atone Ourselves before the hallowed spirits of Our Imperial Ancestors? This is the reason why We have ordered the Acceptance of the provisions of the Joint Declaration of the Powers. If the coup attempt by elements within the Japanese Army on August 14-15, 1945 had succeeded, Anami and the “war faction” could have followed their preferred approach with a thoroughly cowed Hirohito or, at worst, a conveniently dead Hirohito and a pliable twelve-year-old Emperor Akihito. Future use of the one available atomic bomb and six in the pipeline were unlikely to persuade such a junta to surrender all by themselves. Whatever influence the bomb would have had would have diminished as the use of each wonder weapon failed to drive Japanese Army fanatics from the war. Anami and other Japanese officers had already speculated that the American supply of bombs was limited and that those supply limits as well as their observed yield limits made the new weapon no more violent or influential than the equally violent and influential American aerial bombardment and naval blockade and Japan was already enduring those. Plans for using fission warfare as an adjunct to conventional military operations were not “irrational” during the period before fusion warfare was developed (1945-1952). The violence and contamination effects of fission warfare were containable during this time. While they were unpleasant, they were not decisive. From 1952-1965, the United States could have used fission and even fusion warfare in a war with successful effect. The USSR’s weapon, targeting, and delivery mechanisms were too few and too underdeveloped to substantially degrade American military and military-supporting capacities throughout most of that period (though the American margin of safety diminished as time went by). It was only with improvements in Soviet missile technology that gave their fusion weapons intercontinental range with reasonable accuracy and their deployment of these missiles on a large-scale in land and sea launch platforms that created an environment where “destroying the world”, “ending human civilization”, or “mutual assured destruction” were plausible (even if they weren’t guaranteed). A political entity with fusion warfare fighting capacity is not the same as a political entity with fission warfare fighting capacity. The former can inflict more physical violence than the latter and even that assumes the former has appropriate delivery vehicles and that their warfare making ability can endure retaliatory strikes by their target. This entry was posted in The Final Appeal and tagged military history, warfare on December 19, 2012 by Joseph Fouche. This entry was posted in One Ring to Rule Them All and tagged barton whaley, deception on December 13, 2012 by Joseph Fouche. A gallery of legacy spectra, stripped of their original context. This entry was posted in Tiggers are Wonderful Things and tagged spectrum on December 11, 2012 by Joseph Fouche. Each of the following bibliographic entries has been rated on a 0-to-5 star basis. These ratings represent: a) my personal judgment in areas of specialization as with much of political & military intelligence, conjuring, and the history & philosophy of science plus strong data bases in parts of sociology and cognitive psychology; and b) my assessment based on my own weak knowledge of some other domains or non-English languages checked against peer reviews and summaries. Note that these “stars” have been assigned not for a work’s general excellence but only for its specific relevance to detection and deception. Consequently, certain otherwise widely recognized creative masterpieces such as those by English mathematician Alan Turing (1950), German political theorist Hannah Arendt (1963), and American Nobel physicist Luis Alvarez (1987) get only 2 or 3-star rating here. And, for those readers who seek a “second opinion”, I supplement my own judgments with reviews (marked “REV:”) by third parties of many of the more controversial books and articles. J. Bowyer Bell, Dragonworld (II): Deception, Tradecraft, and the Provisional IRA, “International Journal of Intelligence and Counterintelligence, Vol.8, No.1 (Spring 1995), 21-50. This entry was posted in One Ring to Rule Them All and tagged barton whaley, deception, how zen, power, strategy on December 5, 2012 by Joseph Fouche.